Published by Sareth Ney on March 27, 2015 at 2:04 p.m.
Photo credit: campoutforthecause.org. Click the image to "Like" Campout For The Cause on facebook. Photo credit: campoutforthecause.org. Click the image to "Follow" Campout For The Cause on instagram. 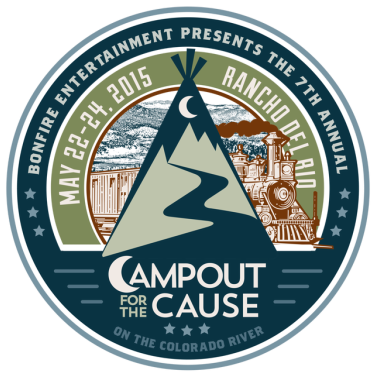 RANCHO DEL RIO, Colo.— The 7th Annual Campout For The Cause will take place at Rancho Del Rio, from May 22 through May 24. The roots music and lifestyle event will consist of camping, live music, stand-up paddle boarding, various styles of yoga and several lifestyle workshops for individuals and groups. Three day passes will be limited to certain amount and will be available for $109. They will be available for purchase on March 31. The amount for tickets will increase to $149, as the 7th Annual Campout For The Cause approaches. The first 300 to purchase tickets will be invited to set up their campsite, on May 21. They will also be invited to attend the fireside family cookout and jam session featuring acoustic performances by Gipsy Moon, Fruition, Bonfire and more. Scheduled to appear in concert are: Birds Of Chicago, Bluegrass & Bloodys, Bonfire, Brothers Keeper, Dead Phish Orchestra, Dustbowl Revival, Elephant Revival, Front Country, Fruition, Gipsy Moon, Grant Farm, Gregory Alan Isakov, HONEYHONEY, Old Town Pickers, Reed Foehl, Shook Twins, The Lil’ Smokies, Town Cavalry and We Dream Dawn. Various types of yoga will be provided by: Gina Caputo, Julia Clarke, Kim Fuller, Jackson, Bobby L’heureux, Maria Schuette, Emily Selonick, Acro Yogis. Heath Perry will be providing lifestyle workshops. The Fractal Tribe will provide performance art. For the first time in the seven year event, a communal area with a fire for roasting food will be available. Water will be free at the event and can be used to refill reusable containers. Klean Kanteen stainless steel mugs will be available for free and can be used for consumption of discounted beverages. The festival is dedicated to the “Walk The Talk” mission, encouraging those to keep the event to be zero-waste with low environmental impact. American Rivers is partners with Campout For The Cause. American Rivers is a non-profit conservation organization and they are dedicated to protecting and restoring America’s rivers. A portion of the proceeds will go to both All Hands Volunteers and Eagle Valley Land Trust.